One of my favorite pastimes is rummaging through piles of fabric at thrift stores. On occasion, I come up with a real treasure. 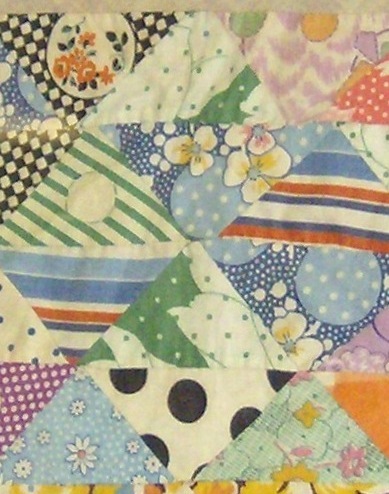 My mom is an avid quilter, and I absolutely adore quilts - especially old quilts. I found this hand-pieced quilt block about 2 years ago in one of my favorite vintage stores - New Bohemia in Austin, Texas. I had found two blocks from the same maker months before, and given them to my mom. Then I found this one, and decided to keep it! I think the fabric is from the 1930s - but I am not sure. It is very old, and the prints are amazing. I just pinned it to a piece of acid free paper and framed it in a cheapie frame. It hangs in my "textile corner" at the iTaggit offices. One of the things I love about iTaggit is how I can store so much information about each item - multiple pictures, the story of how I bought it, and all kinds of specialized fields depending on the item's category. My mom recently added a collection of her small quilts - check them out! Much more on quilting and quilters to come! DIY Wednesday: Jewelry Screen Project! Treasure Tuesday: Funky Jewery Collection!